This DIY buffalo check tree collar was made with very basic hardware store supplies and fabric. You can use any fabric you like to make your own tree collar for under $10! Last year we made our own rustic DIY tree collar and we loved the tidy look of it so much that we decided to make another one. This DIY buffalo check tree collar is on our tree in the living room this year, but we’ll be using the wooden one from last year on the real tree in the kitchen when we go cut that down in a few weeks. Tree collars are getting to be so popular now and for good reason: They don’t bunch up under your tree like a tree skirt does, they don’t collect fallen needles and cat fur, and they’re really easy to clean around. Plus they look pretty great, don’t they? Flexible PVC tubing – There are many different things at the hardware store you could use for this, but the corrugation of this tubing makes it really easy to bend it into a perfect circle without any fuss. Fabric of your choice – This is a great chance to use up extra fabric leftover from another project. We picked up the basic supplies for the frame from our local hardware store for less than $10, but you can also order everything you need for this project from Amazon if that’s easier for you. Start out by making the top and bottom circles out of the tubing for your frame. You want to make one circle that’s a little bit bigger than the other. Measure around the base of your tree stand to make sure that the smallest circle will fit comfortably around the widest part of your stand, then make another circle a little bigger! You can cut the tubing with any basic saw or your can use a plumbing pipe cutter like this if you have one. Use the couplings to connect the two ends of each of your circles. Measure under the base of your tree to see how long you need your dowels to be and cut four of them to the right length. You’ll probably want them to be somewhere between 6-10 inches for most trees. The final step of assembling the frame is just to put it all together! I worked my way around the frame, gluing a few inches of fabric to the top of tube of frame, then pulling it tight and gluing a few inches to the bottom of the frame directly below. Every four inches or so, I had to make a little pleat in the fabric that I was gluing to the top to keep things straight because of the two different circumferences of the circles. It took a lot of hot glue to make this come together and I went through about three big glue sticks between gluing the fabric to the frame, and getting the pleats to hold in place, but I’m happy to report that I managed to walk away with only the tiniest little glue gun burn on one finger. That’s a hot glue miracle! I didn’t pre-measure my fabric at all for this. I really just kept a pair of scissors close by and trimmed the excess off as I completed the gluing on each section. I would say that a yard of fabric would probably be plenty for this project. If you’re using a smaller scrap or an oddly-shaped scrap of fabric and you need to use more than one piece, you can easily create a nice, tidy look by just folding over one edge of the fabric and gluing it onto itself before you start gluing your new piece to the frame. Here’s how it looks on the tree in our living room! And here it is with a few more decorations on the tree. I’d say it fits right in and it really looks exactly how I had hoped it would. Have you made the switch to a tree collar or do you still love to use a tree skirt? I’ve never heard of a tree collar but, I really like the way it looks! I may need to make one for myself. I think I’m going to try this on my outside trees, with vinyl covering. Love that idea! A great way to decorate outside that no one else will think of, I’m sure! 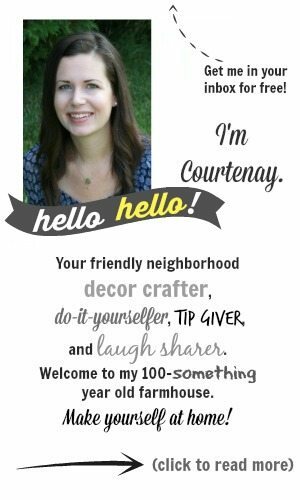 Thanks so much, Courtenay, for this post! I love the idea of a tree collar, but the metal ones aren’t my style. I saw a wicker style one recently I really liked that could be taken apart into four sections for easy storage, which was appealling, for about $40 (more than I want to spend). I hadn’t thought of making my own. I think I’m going to check thrift stores or Dollar stores for a lightweight wooden or plastic container the right shape that I could cut the bottom out of, and cover with fabric. I love that yours could easily be changed up just by recovering with a different fabric. Thanks for the inspiration! That’s a great idea! Let me know how it goes, Vicki!